Your kids will be thrilled when they see these butterfly crafts set up just for them! Butterfly wings are especially great for crafts because of their versatility–there are many different and beautiful ways that you can craft them. These butterfly crafts are especially perfect for a sunny spring day, but you can make them any time of year. Save those toilet paper rolls you usually throw away to make these cute little butterflies! They are super easy, and it only takes a few steps and a creative kid to turn old toilet paper rolls into adorable butterflies. We love painting with sponges! It's such a fun medium to craft in. The finished product for this butterfly craft is too cute. Marble painting makes such a beautiful design on these paper plate butterflies. Your kids are going to love this one. This paper bag butterfly is perfect for afternoon playtime with your kids. It is great as a puppet for make-believing. Plus, it's super cute. Do you have extra coffee filters lying around? Use them for this butterfly kids craft. Add a couple of pipe cleaners and you're almost finished! Transform an old egg carton into a colorful butterfly. Kids of all ages will enjoy making this craft. Cut up squares of tissue paper to start making this pretty stained glass butterfly craft. It's simple and looks so pretty displayed on a window. This foam cup butterfly is bright, colorful, and would make a great decoration in your home for springtime. Copy the designs of actual butterflies for these watercolored paper butterflies. Let your kids get creative by using any colors they want. Washi tape is a great crafting supply as it's so versatile and works for almost any craft or project. This butterfly washi tape craft is no exception. Use any kind of washi tape that you have to make these. Learn about monarch butterflies with this cool kids craft. Use leftover streamers to make the butterfly wings. This is an easy craft that your kids will really enjoy doing. Paint bow tie pasta pieces to turn them into cute little butterflies. End the craft here or glue them to a sheet of paper to make a butterfly scene. Your toddlers will definitely approve of this simple and fun butterfly craft. Gather some paper, markers, pipe cleaners, and glue to get started! Make these crafty butterflies fly through the air on your fingers. You can make one for every finger! Have your kids ever tie-dyed something? 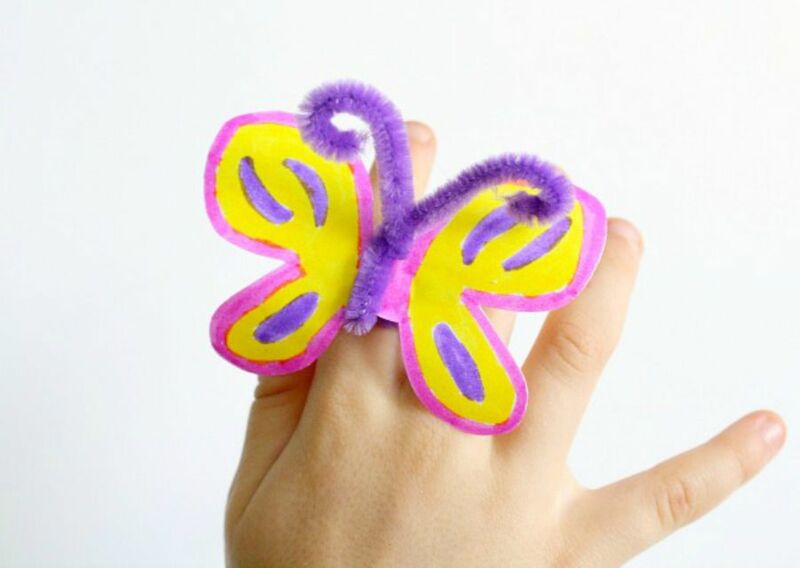 Teach them how with this awesome butterfly craft.